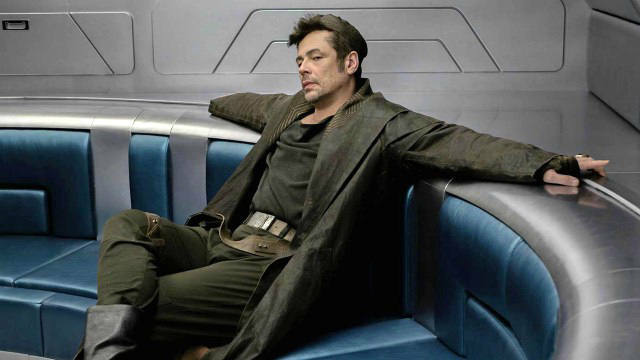 I knew Benicio del Toro was in “The Last Jedi”, or I did at one time, whenever his name was featured in a press release, but by the time he actually appeared in the movie when I was watching, I had forgotten. And I was glad I had forgotten because when del Toro turned up mid-movie he injected the proceedings with…..well, I was going to stay life. But “life” in this context usually conveys something along the lines of invigoration and del Toro was providing life by sort of dialing it down, which the visual language of his introduction underlines. Playing the idiosyncratically named, at least for the “Star Wars” universe, DJ, he is in the same prison cell where a couple of our heroes show up for reasons not to be disclosed, and he first appears by rolling over on his cot, not barging into the movie and clamoring for center stage but waking up from a nap. You half suspect he could have just slept through the whole movie, stirring at the closing credits and wondering where everybody went. And when he busts out of the cell moments later he does it not by cutting the figure of, say, Houdini but one of a guy who just figured out how to use a waterpik. Actors in these movies, as I outlined yesterday in my review, too often are not merely beholden to the plot but steamrolled by it, left with no room to truly exercise their actorly intentions. Del Toro, on the other hand, even as his character becomes embroiled for a time in the quest of the heroes that turn up in his cell, refuses to be steamrolled, going so far as to prop up his character with something like an accent and a stutter. You might wonder the point and purpose of these bits of vocal business. Me, I thought of Eddie Izzard many years ago, in the wake of the release of the mostly forgettable “The Avengers” explaining that his villainous henchman was always chewing gum because the gum was his Method. The accent and stutter are del Toro’s Method. Whether it’s true or not, I will always believe that del Toro had it written into his contract that he got to have an accent and a stutter. He needs those, dammit, because he needs to play something. Rarely in “The Last Jedi” is anyone playing something other than what they have already done or what they assume a person in a “Star Wars” movie would do. And in seemingly subscribing to his own whims, del Toro renders the otherwise predictability of his character’s turn behaviorally true, like he really is making this all up on the spot, exiting “The Last Jedi” with what may as well be a shrug. And in a movie that is Stakes or Nothing virtually all the time, that impassivity became the ultimate tonic.